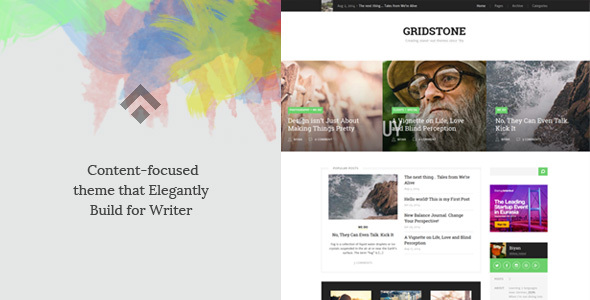 Gridstone, a content-focused blogging theme with easy vertical design and great typography that allows your visitor to enjoy the flow of reading across articles. The design is created to immediately create a sense of confidence to your visitor. Not too crowded with content, but just enough. Gridstone allows to easily repositioning the sidebars (left, right or none), re-adjust the blog width and customize the color scheme through Theme Customizer. It also features flexible-touch-enabled carousel slider, integrated lightbox and post formats — just various ways to highlight your content. Theme Customizer to help you easily create your-only-skin. Fancy optional homepage sliders: Carousel and Flexslider. Three predefined layouts: Right, left, and no sidebar. Responsive layout that adapts to the screen size of whatever devices your visitor are using. Optional related post feature that helps your visitor easily navigate across related articles. Optional random latest post. Just an easy way to highlight your latest content. Custom widgets: Flickr, Twitter, Contact, Images and Author profile.